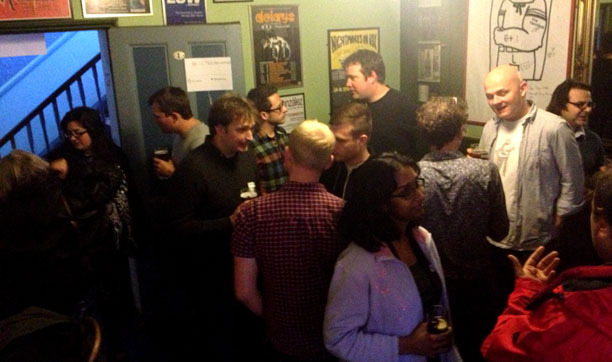 So last Thursday (April 18th) was the first meetup of the fledgling ICT4D Brighton group. I counted 21 people at the peak which, from an RSVP of 32 and a group-size of 50, I think can definitely be classed as a good turnout, and demonstrates an appetite to keep things going and look to future opportunities. It is interesting to compare the makeup of the group to its bigger and more established elder brother the London ICT4D Meetup group (http://www.meetup.com/London-ICT4D). Given the nature of London it is unsurprising that this group contains a lot of people working for big NGOs, industry/government groups (GSMA etc.). Brighton on the other hand, being a relatively small City, seems to have more individual consultants, designers, creatives and techies, plus a healthy representation from the two Universities. I hope that as the group develops, this difference could become something to explore when investigating the potential to pull both groups together in some way – whether this be for co-working opportunities or to act as some kind of ‘voice’ or whatever may develop. So thank you everyone for coming – those I had a chance to speak to properly and the few people I only got to say a brief hello to. I saw at least 4-5 people effectively (and subtly) touting for work – to greater or lesser degrees of success. This is obviously one of the many reasons a group like this comes together, so any suggestions on better ways to facilitate these kinds of discussions in between meetups would be great? This entry was posted in Development, ICT4D, Jobs, Meetups and tagged ICT4D, ICT4DBrighton, Meetup on April 21, 2013 by matthaikin.